The 2015 SCBWI Crystal Kite Winner for the Atlantic region! Even under the most normal circumstances, high school can be a painful and confusing time. Unfortunately, Lilianna’s circumstances are anything but normal. Only a few people know what caused her sudden change from model student to the withdrawn pessimist she has become, but her situation isn’t about to get any better. When people begin coming down with a quick-spreading illness that doctors are unable to treat, Lil’s worst fears are realized. 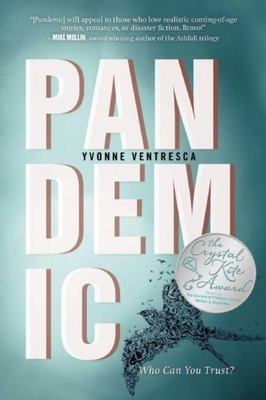 With her parents called away on business before the contagious outbreakher father in Delaware covering the early stages of the disease and her mother in Hong Kong and unable to get a flight back to New JerseyLil’s town is hit by what soon becomes a widespread illness and fatal disaster. Now, she’s more alone than she’s been since the incident” at her school months ago. The paperback edition will include bonus materials and a sample chapter from Yvonne Ventresca's upcoming YA novel, Black Flowers, White Lies. Yvonne Ventresca is a middle grade and young adult author. Ventresca has previously published two middle grade nonfiction books with Lucent Books: Publishing and Avril Lavigne. She has also written over thirty articles for various print and online publications, including ByLine Magazine and FolksOnline. She currently resides with her husband and two teenage children in Chatham, New Jersey.